There are a lot of talented milliners posting photos of the exteriors of their wonderful creations, which are very inspiring. But, I'd also like to see the insides of the hats and undersides of the fascinators. 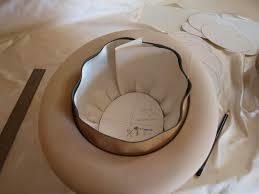 I'm curious as to how many modern milliners are putting full linings in their hats and what kinds of linings. And I'd love to see what your labels - which are basically your artist signatures, and will be how people will know the hats were made by you - look like. So in short....I'd love to see your labels and linings. Please post photos! I line all my hats with silk dupion and use woven labels. try FANCYWEAVER on ebay. they have all kinds of labels and their prices are reasonable. I use woven labels. hope this helps. I'm about to get new labels made as ones I bought on-line are pretty awful. They will be woven and sew-in - as I think this looks more professional. Great question. I'm keen to see what others' do as well! I LOVE your Etsy store, Greer. Double Expresso is my favorite! Has anyone heard of a wire tripod that can be used to attach a fascinator? Someone was trying to explain how they worked on another board, but I couldn't quite make any sense of it. Is this the kind of thing you're refering to Cynthia? A pronged wire headpiece that attaches hat to head securely but sits under hair making it invisible when worn. Very nice, Aoife. Thanks for the picture - now I can visualize what they were talking about! Do you use the same millinery wire for the prong/tripod? I used cotton covered millinery wire for this one. You can also cover it with tulle in the hair colour of the client as it helps to grip the hair. Do you basically just form the wire according to the headshape? How many pieces of wire do you normally use to make sure it sits secure? Or does it depend on the type of hat, angle and weight? Yes you shape it to the headshape on a dolly head/poupee using one piece of wire. How many prongs you make depends on weight, shape, etc. For the hat above I made 4 prongs. One behind each ear, one to back of the head and as it sits slightly forward on the head, one further forward. For lighter pieces I would just use 3. One behind each ear and one to the back of the head.